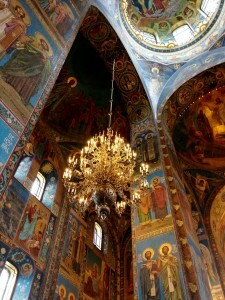 This is the interior of the Church of the Savior on the Spilled Blood in St. Petersburg. We got there as a service was going on in a side chapel: incense burning, heavenly chant by the choir, priest arrayed in vestments of finest gold, people gathered, standing, silently bowing and crossing themselves and lighting candles as the service went on. Of course the church in Russia was nearly dead during the Soviet years: 1,000 churches in St. Petersburg at the time of the czars had been reduced to about 5 or 6 still open by 1990. Other church buildings were demolished, or turned into warehouses, military training facilities, or even (in one case) an indoor swimming pool. Now, the church is coming back to life. Five hundred churches are now open in the city, and in each one we entered (on weekdays), there were worshipers gathered for the Divine Liturgy in progress. 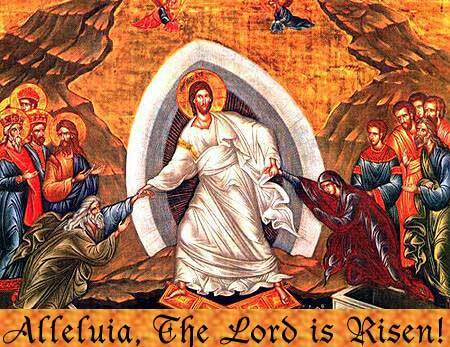 Christ is risen, indeed. Which brings me to wonder why we are so concerned about the future of our church. Amidst great anxiety about declining numbers and tight finances, The Episcopal Church gathered in General Convention this summer. It was my second Convention, and after my first, in 2009, I wasn’t sure I would return. The anxiety, conflict, and stuck-ness seemed hopeless. 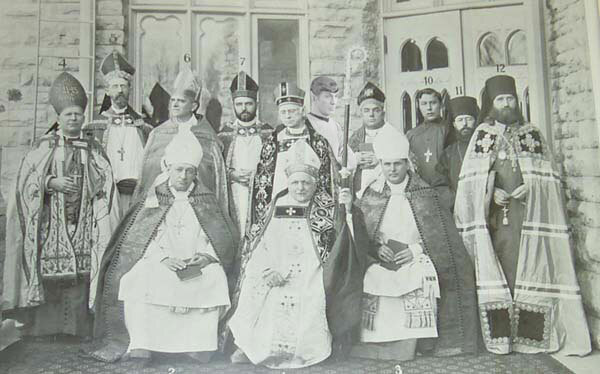 We made some good decisions, but seemed unable to address the vital issue of how to reverse, or event confront, the church’s decline. Like many people, I hope that “restructuring” is about more than, well, restructuring. I hope this is not just another organizational quick-fix that changes a few lines of authority and re-draws our church’s flow chart. I hope that instead, this “restructuring” becomes a reawakening. I hope that we pray together, discuss together, gain insights from people not otherwise heard, and learn from each other. I hope we follow the guidance of the Holy Spirit. I hope this becomes a new beginning for our church, the start of an explosion of new energy, new ideas, and new people. In the meantime, I have been elected, along with 37 other people, to serve on Executive Council, our church’s Board of Directors. Members of Executive Council recently received a request to write a one-page introduction and name what we see as the three top priorities for us to address this triennium. We also were invited to ask any questions we have about how Executive Council works. For my priorities, see my blog post here. I would welcome your comments and additions. For Acts 8 folks – how should we be praying for this restructuring and reawakening to unfold? How can we spark a renewal movement, through the kind of prayer and Bible study and vision for the future and dreaming that we shared at General Convention? How can we begin to share what we have experienced, and what we long for, with people throughout the church? It is my honest opinion that without prayer and reawakening, this restructuring will be simply a restructuring. And that would be a loss for all of us. I believe the most vital thing for us to discover is, how is the Holy Spirit leading us into a new era? Difficult times have beset the church from the very beginning, and Holy Spirit has always led us into new possibilities we never would have imagined on our own. Re-read Acts Chapter 8 if you have any doubts about this. 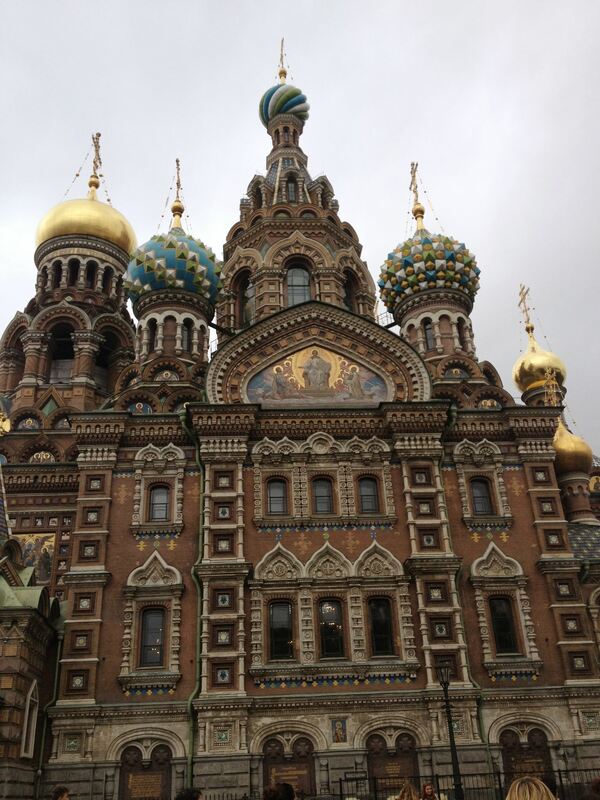 Or, if you still doubt that a declining church can be reawakened, maybe the Church of the Savior on the Spilled Blood in St. Petersburg will inspire you. The refurbishing is almost complete. The smell of incense fills the air. The sound of heavenly chanting fills the hearts of the worshipers who gather to pray and hope and share the Eucharist together.